The pace of hiring in November serves up the latest evidence that U.S. payrolls continue to expand at a steady pace and measures of labor market slack are also tightening. With the U.S. economy on track to add 2.2 million jobs during 2016, the path for the Federal Reserve to raise its benchmark short-term lending rate later this month appears to be clear. A more aggressive pace of rate increases could ensue in 2017 as the central bank monitors the effects of the new administration’s policies on economic trends and inflation. An expansion of private-sector payrolls and hiring at government agencies underpinned a gain of 178,000 positions last month, a level more than sufficient to absorb new entrants to the labor force and take up slack. The addition of 63,000 professional and business services workers led growth in all sectors and included nearly 24,000 new posts in technical services, a primary office-using field. After subdued growth in the past five years, the greater share of office-using jobs attributable to gains in technical services payrolls in 2016 could accelerate an increase in office space demand next year. An unemployment rate of 4.6 percent and an underemployment level of 9.3 percent mark the lowest levels in each measure during the current cycle. 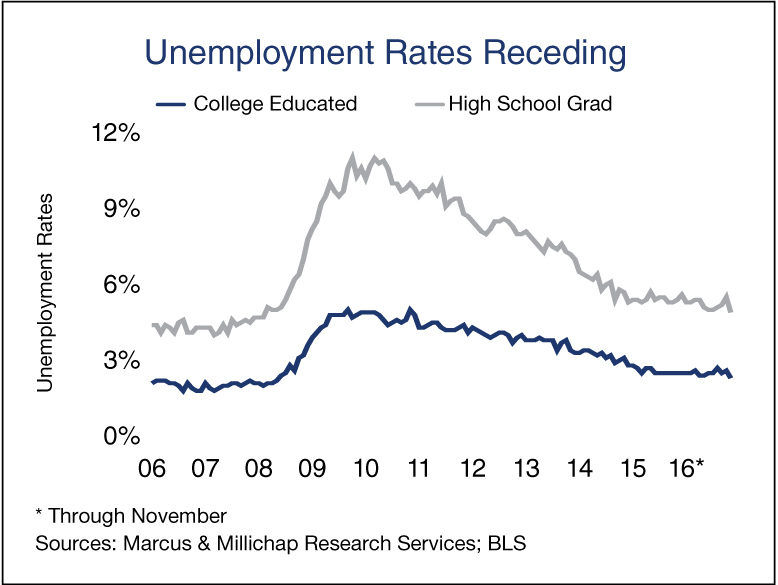 Breaking it down further, the unemployment rate for college-educated workers also hit a multiyear low of 2.3 percent last month. With a record level of job openings and a dwindling supply of college-educated workers available to fill many of the open spots, employers may encounter greater challenges meeting staffing needs in the coming months. Monthly job gains could moderate as a result, but this is not a sign of the economy weakening. Additional growth in technical services payrolls continues to positively affect office property performance this year and appears positioned to make a greater contribution in 2017. In 2016, the U.S. office vacancy rate is on track to fall to 14.4 percent and an additional decline is anticipated next year. A missing element of the current improvement in office property performance is financial services employment, which remains below the pre-recession peak even after adding 145,000 positions so far this year. Payroll additions and rising wages support increased household formation, helping to maintain strong demand trends and low vacancy in the U.S. apartment sector. This year, the national apartment vacancy rate will decline to 3.8 percent. The projected delivery of 371,000 apartments in 2017 will likely mark the peak of the current construction cycle, but vigorous absorption means the national vacancy rate will only rise nominally. Class A complexes will be most vulnerable to new supply, while the Class B and Class C segments will maintain robust demand trends. This entry was written by marcusmillichap, posted on December 2, 2016 at 11:37 pm, filed under Uncategorized and tagged Economic Growth, Economy, Employment, Marcus and Millichap. Bookmark the permalink. Follow any comments here with the RSS feed for this post. Both comments and trackbacks are currently closed.